Vintage Pressed Milk Glass Jug Creamer White Geometric pattern pressed glass. Unsure of age but guess period art deco. Good vintage condition. Some slight wear and manufacturing imperfections. About 7cm tall to the spout. Please view my other items. We are part of the global Red Cross and Red Crescent humanitarian network. We refuse to ignore people in crisis. Refusing to ignore people in crisis. Six pretty pressed glass sundae dishes - with opaque and clear glass. They are good solid dishes and in total weigh about 1.5kg. Vintage Amber Glass "Egyptian Revival" Sugar Bowl & Cream Jug. A lovely duo of Art Deco Cream Jug and Sugar Bowl in Amber coloured glass. Brilliant pressed glass with that Art Deco look and style. Heavy star cut base with fluted lip. IT HAS ANGULAR SHAPES AND FLOWER AROUND THE OUTSIDE, THE GLASS IS OPAQUE AND HA A SLIGHTY OILY APPEARNCE INSIDE. I SUSPECT THIS HAS BEEN USED AS A SUGAR BOWL WHICH WOULD ACTUALLY LOOK FANTASTIC WITH THE BLACK AGAINST THE WHITE. PEACOCK BLUE PRESSED GLASS HOBNAIL TEXTURED GLASS BOWL. HEIGHT 6 cm approx 19 cm at widest. Lovely turtle shell glass bowl in a beige/gold colour with a pearlescent finish. Measures approx. 21 x 23 cm x 5 cm deep. Tray 30 x 23 Cm. You could get it cheaper. I am happy to m ake a deal or two. PAIR WALTHER CARO PATTERN 42951 PEACH PINK. CLEAR PRESSED GLASS CANDLESTICKS. Hollow diamond-shaped base with cut glass side. Four-sided stem, tapering to a diamond-shaped. on Candlestick 2 there is a chip on the. The would make lovely centre pieces. Art Deco bowl small chip on foot. Art Deco bowl small chip. PRESSED CARNIIVAL GLASS. HEIGHT 2", 9" AT THE WIDEST PART. 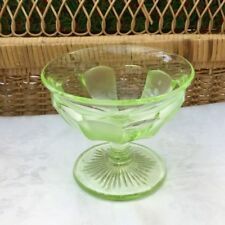 This is an Art Deco style pressed cut glass trinket dish in the shape of a pear made in Italy as marked on the base. This is as seen in the pictures and forms two halves where one section sits on top of the other as a lid to the base. JACOBEAN (REG.D). Small tankard. Pressed Amber Glass. PRESSED CARNIIVAL GLASS. HEIGHT 3 1/2", 8 1/2" AT THE WIDEST PART. Art Deco c1930's blue pressed glass fruit bowl - centre piece. Centrepiece BOWL. I this maybe by Davidson Glass circa 1930. Weight 1.57 kg. It has a lovely ring to it and is heavily weighted. Blue Art Glass Fruit Bowl Window Vase Pressed Roses Ribbed Rose Flowers Flared. Old pressed glass oval bowl or vase in an ice blue colour with raised triple roses to the front and back ribbed and flared at the ends with a lined base. To the front and back there are glass rim hooks from the top about an inch. These may have been to support a long lost handle of some kind, just a thought. Measures approx: 10.75 inches by 7.5 inches across the top by 4.4 inches tall. No damage found. Includes U.K. delivery. Global shipping is available. Cash on collection welcome. Thank you for viewing. Lovely Vintage Art Deco Glass Crudite/ Hors D'Oeuvres Dish 5 Separate Removable Sections. 12" /30cm Diametre Very good condition See pics for details. 3 Handled Bowl Frog insert. Pink cotton bowl/jewellery bowl with lid. Weight 810 gramm, width 16 cm, height 11 cm. Superb Rare Vintage Duncan Sandwich Pattern Pressed Glass Platter & Basket. Duncan & Miller closed in 1955, but Sandwich pattern was continued at Duncan & Miller Division of United States Glass Co. In the 1960's Duncan molds were acquired by Indiana Glass Co. and the pattern has been manufactured for Colony in crystal. GREEN SLIGHTLY OPALESCENT / CLOUDY PRESSED GLASS. HEIGHT 6 1/4", 3" AT THE WIDEST PART. Beautiful Vase. You could get it cheaper. Very distinctive and stylish, these Art Deco era fruit bowls have a ribbed pattern radiating from the centre, a crenulated edge and an intense blue colour that looks very attractive against a white tablecloth. Conical shape with star burst in the base. Channel Islands, Isle of Wight, Isle of Man, Scilly Isles, Scottish Highlands, Scottish Islands, Northern Ireland. HAS THE LOOK OF CHIPPENDALE. SUPERB DECO SHAPE! VERY STRONG GREEN GLOW UNDER BLACKLIGHT! 12CMS X 6.5CMS BASE DIA X 7CMS HIGH AT HANDLES. AND, EXCELLENT CONDITION. We are only passing on the costs associated with getting the item to you safely and in one piece. REST OF THE WORLD: International. Lovely vintage Rosice glassworks smoke glass vase designed by Frantisek Vizner in 1962 model No 902. The vase measures 16cm tall x 9 cm at its widest point and is in excellent condition. 1x Lge bowl - Height 8 cms. SERVING BOWLS. GREEN GLASS. These look like uranium glass, but my light is not working. 5x Small bowls - Height 8 cms. A great addition to any collection.